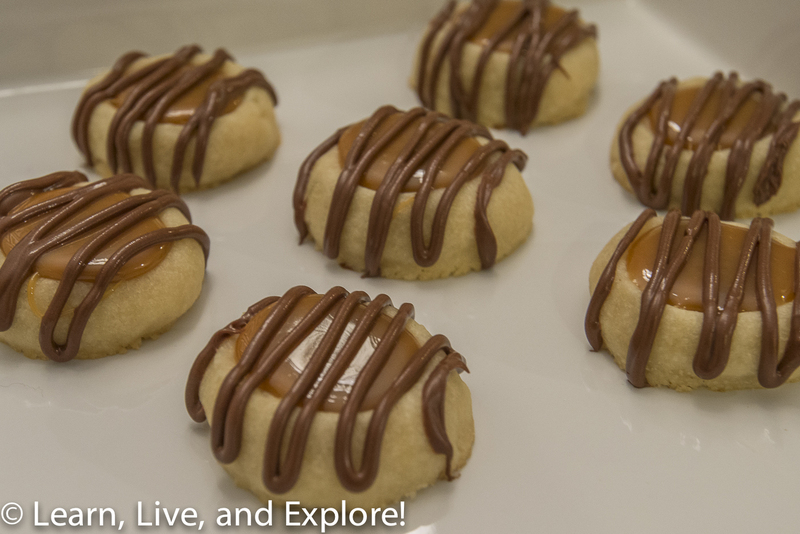 Deconstructed Twix Thumbprint Cookies ~ Learn, Live, and Explore! I think I can finally say that I am not a fan of working with caramel. It is messy, sticky, difficult to clean up, and can burn your skin if you touch it when it is molten hot. That being said, it was worth it to make these cute and delicious deconstructed Twix bar cookies. Thankfully, I skipped the step of making my own caramel, just melting Kraft caramels. Just like a Twix, the three layers are shortbread, caramel, and milk chocolate. The inspiration for these cookies is from The Recipe Critic. Let cool on a wire rack with wax paper placed below the rack (for later chocolate step). In a microwave safe dish, slowly melt about 1 caramel square per cookie. Using a small, heatproof spoon, carefully drop liquid caramel into the well of the cookie and gently push to the edges. In a microwave safe dish, melt the chocolate chips, 5-10 seconds only at a time, stirring after each interval until melted and dripping freely off a spoon. Pour the chocolate into a squeeze bottle or use a spoon to stripe chocolate across the caramel and cookie. Allow chocolate to harden before placing cookies into a storage container. Greystone has patents and trade secrets surrounding their product. They believe this is their major advantage over other customers.